In Star Wars: Galaxy of Heroes, one of our key objectives has been for players to fulfill their ultimate Star Wars fantasy by collecting characters from different Star Wars eras to master the galaxy. However, we know players like to play the game in different ways. Some are more focused on competition, some more on the collection components. Some guilds require certain rosters and squads to master the different raids, while others are seeking new yet-undiscovered mechanics by different squad makeups. All of these strategies work, and for players to have the best experience, it’s important to know what you need and how you might obtain it. This will now be much easier to figure out with the pack probabilities information combined with the Character Release Cadence, and a number of community tools. Pack probabilities can help aid you in making decisions about what to go for and when. We’ve been working to put together information on pack probabilities across all the different packs in the store and describe it as clearly as possible. Along with sharing the specifics of our pack probabilities (and some things we’ve updated along the way), we would like to provide additional understanding around how our packs work overall. If you’d like to skip straight to the disclosure page, it’s available here and will be direct linked from the details page of every crystal pack in the store after our TU13 client update. If you’d like some more specific information about additional changes we have made, please read on. 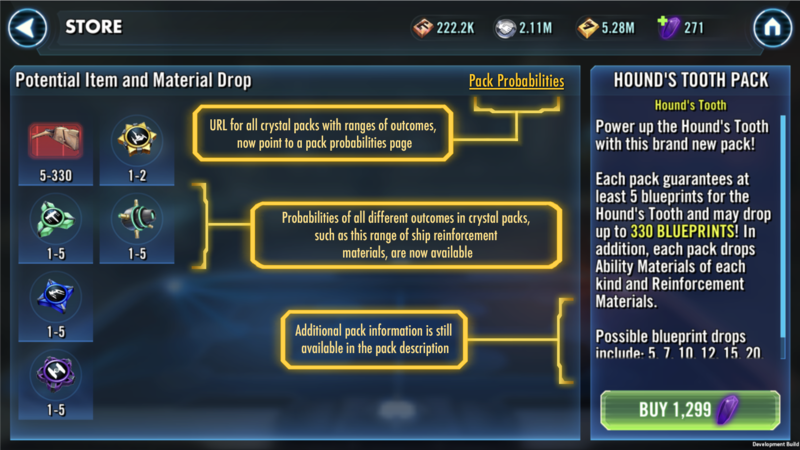 There are many different packs and pack types in Galaxy of Heroes, many of which have different probabilities. However, there are no “dynamic odds”. We don’t change pack probabilities or outcomes based on any player behavior or criteria. You will get something of value in every pack. However, as many of you are aware, some of our packs have low probabilities for larger amount of character shards/ship blueprints. For example, a single character marquee pack will most likely net between 5 and 7 shards (more often 7). However, there are opportunities to receive significantly higher shard counts in packs as well. The pack probabilities are not a guarantee of outcome. Every time you open a pack is an independent event. Getting a high shard count in one pack does not mean you will definitely get a low count on the next pack. The probabilities reset with every pack. We’ve taken this opportunity to improve the way a few of our packs work. As the game has evolved, we’ve found that some of the previous designs needed an overhaul. As an example, we’re doing away with the “new” and “old” character/ship distinctions, because that’s become a bit outdated and becomes excessively complicated with the more items we have in the game. The probability of getting any one character/ship within a pack will be equal across all characters/ships in a pack (unless otherwise noted). This will mainly be noticeable in Fleet Packs. Any future changes to the pack probabilities will be updated on the website, and we will make sure to draw your attention to those changes via patch notes. We’re hoping these additional changes will provide information that improves your game experience. As always, we evaluate the probabilities alongside other game mechanics and will communicate any additional updates we make in the future. It’s kind of what we knew but happy to see it posted. Ty Car. Holy crap.... I can't believe they're actually doing this finally. Just no 1-2 month wait. A link to a PDF. Not exactly optimal. HTML webpage please, some of us don't like downloading possibly compromised documents. Lawyers required it since some people are addicted to gambling?? Thank you for releasing that. I had thought that newer toons had a slightly higher chance to appear in Chromium Mega Packs than the toons that have been around since the start... I was actually thinking about using Chromium Mega Packs as a means to farm the newer Solo movie scoundrels and KOTOR toons ... but if the chances of all toons are the same, then, well, that's out the window. I have to say, the 2* character unlocks via Marquees have really made Chromiums a very unattractive gamble. Whereas older toons could net you, say, 80 shards if you pulled a full toon card (Barriss, for example), every marquee toon will net only 25 shards if you pull a full toon card. Makes the gamble far less attractive than it used to be. You know they raised some of those stats before they released this. Chromium is the major driver of the point #4 above about new vs. old. We did used to have two buckets to guarantee one "new" toon and one "old" toon. However it got complicated quickly, how long would a character be new, etc. etc. But you're dead on, chromium has a lot more value if you're not sitting on most of the characters already. I thought this too. The few packs I did buy I got some newer topical toons along side other older ones. Does it mean we are getting the infamous TU13 really SOON? @CG_Carrie Thanks for this. Any chance we will be getting (1) a road-ahead type post anytime soon; (2) another Q&A session with the devs; and (3) confirmation that Revan is dropping soon ? This is a huge step in the positive direction. Glad to see this. That's why no one buys that stuff. Spending loads of crystal for the shard shop isn't that intelligent. Yes. Also this goes along with the previous road ahead post fixing/changing things that are in the game already. Ships, mods, packs. Is there anything else on the horizon in terms of bettering things already in game? 2. Q&A - you're right we're probably due for one, just haven't scheduled it. I'll take this action item. 3. If you ask me one more time, that tach gland won't be the only freshly-harvested organ around here. Mayhaps. I think ppl do buy it though. It’s still there. Not that that is any mounting evidence. Don't suppose we could get a bit of info on the cost per tier of slicing a mod, before the update itself (just curious)? Also, is the trademark on 'SOON', or the whole sentence? This is important to know! So, right now, before the next major update, there are still "new/old" buckets? Because you said, "we did used to have two buckets..." implying that that change has already been made. Tell me quick, as now might be the time to use Chromium Mega Packs in order to get some of the newer toons! Sorry my bad, add two more VERYs. This is good for the industry and ultimately good for the game. Nobody can complain if they're going into a purchase with their eyes open. Also, umm don't really have time to do that. I wouldn't rush to buy now - as the update is, as they say, very very very very very soon.